While being hosted by USP undoubtedly opened doors with participants and made the fieldwork far simpler to organise remotely, I still encountered the inevitable challenges associated with conducting research in a developing country context, thousands of miles from the familiarity of home. The techniques I had prepared for setting up interviews through methodically emailing, calling and making appointments ahead of time proved to be ineffective in a cultural context in which face to face conversations and storying are the norm. After two fruitless weeks of desk-based attempts to contact participants, I abandoned my USP office to wander Port Vila’s streets, notebook and dictaphone in hand, searching out the relevant office buildings. Luckily, as detailed maps and road signs were also hard to come by, government buildings marked with flags were relatively easy to spot. Once I had met with a handful of very helpful people I was armed with a list of relevant organisations and some directions, my study finally began to take off. The experience was eye-opening and rewarding, both personally and academically. 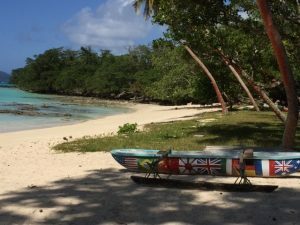 Vanuatu, as a least developed country, the world’s most at risk to natural disasters according to the UN’s 2015 World Risk Index, and extremely vulnerable to climate change impacts, faces numerous challenges. Cyclone Pam, which struck the islands in March 2015, caused an estimated $449 million in loss and damage amounting to a staggering 64% of the country’s GDP. The devastating power of climate related impacts in the region is clear, not only in terms of immediate damage but also, more indirectly, through the economic hardship caused by reduced crop yields among many remote subsistence farming communities, or the impacts of oceanic acidification and warming upon marine ecosystems that many coastal villages depend on for both food and tourism. Talking to those who work closely with these communities at the grassroots level revealed many anticipated issues, from geographic remoteness to a lack of access to institutional support. However, it also revealed the inherent resilience, strong sense of community and traditional knowledge which has enabled devastated communities to recover and should play a central role in the development of climate change responses going forward. Through the case study, I set out to examine the existing climate policy responses at the regional and national levels, the availability of legal mechanisms and the challenges associated with access to justice faced by communities in practice. In the wake of the adoption of the Paris Agreement at COP21 in December, climate change and debates surrounding the follow-up action needed is at the top of the Pacific policy agenda. While the Agreement has been hailed as a significant step forward for the international community with many states making voluntary commitments to cut their greenhouse gas emissions through Intended Nationally Determined Contributions (INDCs), many aspects of the Agreement leave much to be desired, particularly from the point of view of the most climate vulnerable. There has been no clear mapping out of the financial support pledged by developed countries to assist in the adaptation and mitigation efforts of developing countries. The Agreement itself contains no enforcement mechanism or legally binding GHG reduction targets and, particularly concerning for Small Island Developing States (SIDS) and Least Developed Countries (LDCs) such as Vanuatu, loss and damage has been consigned to a vaguely worded clause with an express exclusion of any right to compensation. These inadequacies are already being reflected in the reservations declared upon ratification by a number of Pacific nations including the Cook Islands, Tuvalu and the Marshall Islands providing that they view the progress so far to be insufficient to prevent a global temperature rise of 1.5 degrees and that they do not renounce any existing rights under international law. In light of the vast potential for resulting damage in Pacific SIDS, securing more direct access to climate finance and seeing loss & damage addressed more effectively at the international level have emerged as core priorities for both governments and regional bodies. The question of whether alternative legal avenues can be of assistance in securing access to such funding however has yet to be answered. My own assumptions that human rights mechanisms would offer the greatest enforceability and therefore represented the best available avenue in terms of climate litigation have been fundamentally challenged. Limited institutional capacity and funding can be seen to restrict the ability of governments in the region to effectively engage with international human rights conventions along with their corresponding reporting requirements, leading to very limited numbers of ratifications and, in turn, a lack of access to the complaints mechanisms those conventions provide for. In addition to this, Pacific states are without any regional human rights mechanism which could have provided for both greater enforceability and greater engagement with international human rights standards. Despite efforts by regional bodies such as the Secretariat of the Pacific Community (SPC) to provide a blueprint for the development of such a mechanism, this is currently not on the political agenda. A great deal more research is needed to fully explore the legal options of climate vulnerable states in the region with respect to the loss and damage that they will continue to suffer. While it is clear that Pacific SIDS are keeping their options open with respect to international legal obligations and state responsibility, at present the hope appears to be that the momentum generated in the run up to the adoption of the Paris Agreement will carry through the stronger commitments needed, both in terms of emissions reductions and financial support. I have learned that climate justice has many facets, not merely the more obvious distributive injustice of the manner in which the impacts of climate change manifest themselves by hitting the poorest and those who have contributed the least to global emissions the hardest, but also more procedural aspects of access to justice and the efficacy and availability of institutional support. Climate justice demands a focus on the challenges faced in practice by vulnerable communities, affording them the opportunity to exercise fundamental rights and to make their voices heard. The inter-linkages between the national, regional and international levels of governance and policy making should be strengthened, carving out a definitive role for civil society in the process. Civil society organisations are crucial, not only in terms of responding to immediate disasters, but also to raise awareness of climate change and its human rights implications, to assist governments in the implementation of climate policies where institutional capacity may be lacking, and to amplify the needs of communities. One approach encompassing all of these many facets will be difficult to construct and may seem near impossible politically to implement, but we as climate change researchers should take heed of the example set by Pacific SIDS who, in the face of incredible adversity, have rallied to lead by example in the international community with ambitious climate policy proposals, along with close and effective collaboration. * Alice Venn is a second year PhD student on the Environment, Energy & Resilience ESRC 1+3 programme. United Nations University Institute for Environment and Human Security UNU-EHS, World Risk Report 2015, available online at: http://collections.unu.edu/eserv/UNU:3303/WRR_2015_engl_online.pdf (accessed 08/06/16) at 46. Simone Esler, Vanuatu Post Disaster Needs Assessment Tropical Cyclone Pam March 2015, Government of Vanuatu, available online at: https://www.gfdrr.org/sites/default/files/publication/PDNA_Cyclone_Pam_Vanuatu_Report.pdf (accessed 9/6/16) at ix.